Innovative educators know that teaching and learning is shifting. Today students can watch lessons on their devices and progress at their own pace and teachers don’t have to waste time giving the same lecture multiple times a day. 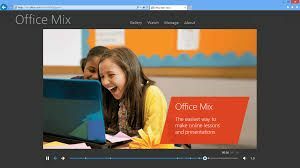 While watching lessons automates what is done in the traditional classroom, there is a new tool called Microsoft Office Mix which brings lectures and lessons to life by turning PowerPoints into interactive lessons called “Mixes” that are very simple to create. All you need to do is record lectures while you write and draw on your slides, and add audio, video, assessments or labs, and also the stuff that really makes lessons pop, like as animations, live links, or quizzes. Fitting into teacher’s lifestyle is analytics, and OfficeMix has built that in so you can track every student, quiz, and slide to see how they’re performing. OfficeMix is free if you have PowerPoint 2013 for Windows. Or if you have a Mac, then you can run Windows on it, and still use Office Mix with PowerPoint 2013 on your Mac. But really the coolest thing (at least your students will think so) is that Mixes play like YouTube videos and can be viewed on phones, tablets, or personal computers. Students can watch them online or on their phone or iPad -- which fits their lifestyles. 1. Add audio or video to your mix – using Office Mix’s recording. 2. Add animations - using PowerPoints built-in animations functionality. 3. *Add inking – which can be synced to your voice (if you have a touchscreen or style). 7. Have your students make a Mix. As innovative educators look for new ways to reach students and increase focus in the classroom, Office Mix is a great way for students to interact with lessons on their own and use classroom time for doing, discussing, and receiving focused guidance and support from their teacher and peers.